Let's say you've already rooted your device and you have custom recovery such as TWRP recovery or ClockWorkMode(CWM) recovery or Philz touch Recovery installed and you are ready to give installing a custom ROM a trial, just remember that there are risks involved, so try this at your own risk. picking out a custom ROM is very important as there are plenty of great rom out there, but unfortunately not all of them will support your device. So if you are new to custom ROM installation, Cyanogenmod is great starting point because it support a wide range of device. So you can check the Cyanogenmod wiki page to see if your device is listed among the hardware supporting their ROM. 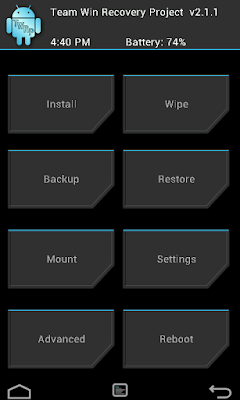 Now that you've got a custom recovery installed/flashed on your phone, the first thing you should do before you ever flash any ROM is to back it up. This backup is done through the recovery mode and it's what we call 'Nandroid backup", which is basically an image of your current system. That way, if something goes wrong, you can restore your phone back to the way it was originally with all the files and data on your phone during backup restored without anyone of them missing. Performing this will save you a lot of hassle if something goes wrong while trying to install custom ROM which, let's be honest, can happen often. Power off your phone and enter recovery mode. This is a bit different on every phone, but usually involves pressing the power and volume(up or Down) buttons at the same time. This must be done while your phone is off. 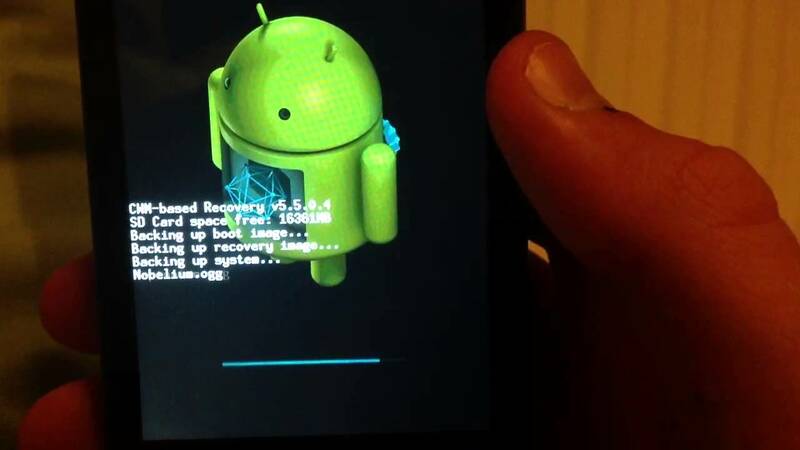 Head to the "Backup" or "Nandroid" section of your recovery mode. The default settings should be fine. 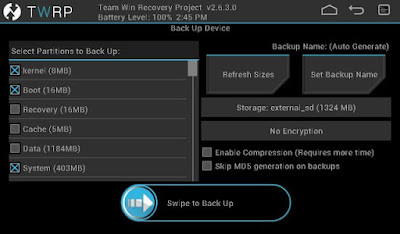 If given the option, give your backup a name that helps you remember what it is (like e.g "CWM Backup 19-08-2016" if its CWM recovery you are using and " TWRP Backup 19-08-2016" if its TWRP recovery you are using). Confirm your backup and let it run. Wait for the backup to finish. Once you are don with the backup, then you are good to go. you can tweak your phone the way you like. Now if something goes wrong during tweaking/flashing, you have a nandroid backup to restore the phone back to it's original state. 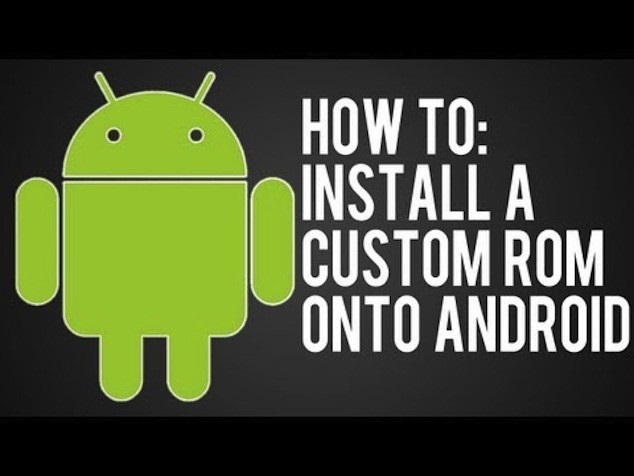 Step 2: Once you figure out which ROM you wish to install, go ahead and download it. If it's your PC/laptop you used in downloading it, then you have to move to step 3. Step 3: Connect your Android device up to your computer with USB cord. 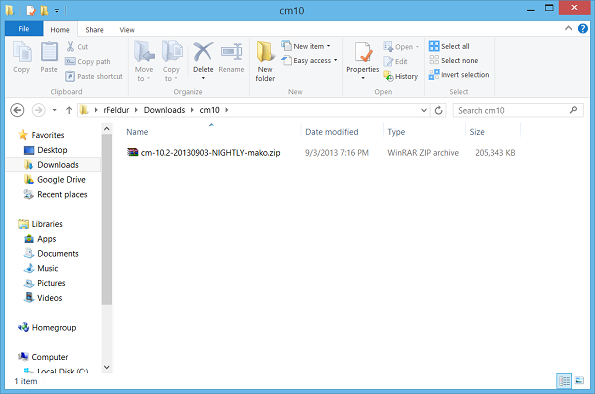 Now go to the location of the downloaded .ZIP file(can be either ROM or GAPPS or Bug fixes) and copy them over to your device SD card(external memory card) root folder. 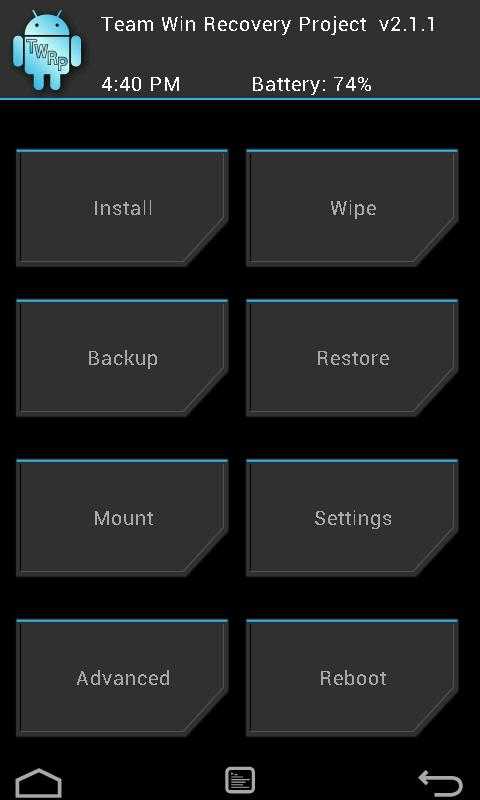 Step 6: from the recovery screen select “wipe data/factory reset” option. 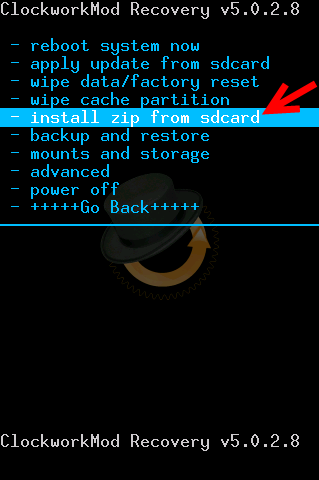 In TWRP, you'll find this under the "Wipe" section, and from there you can check the option you wanna wipe such as data, cache partition and delaviv cache and in ClockworkMod, you'll need to either choose the "Wipe Data/Factory Reset" option or the "Wipe Cache Partition" option depending on the ROM installation guide. To wipe Delavic Cache on ClockworkMod recover just navigate to "Advance" at the recovery screen and select. When it asks for confirmation, select “Yes” to confirm data wipe process. 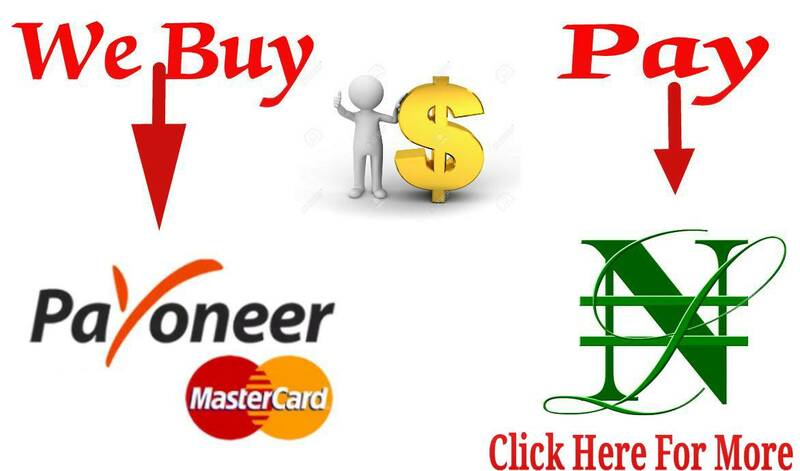 Then navigate back to main recovery when you have cpmplrted the process successfully. If you’ve never used recovery before, navigation works by using the volume buttons to move up/down and power button to select. Note: If you copied any other zip file alongside the ROM file (like GApps and Bug fixes zip), repeat the above steps to install that zip file. 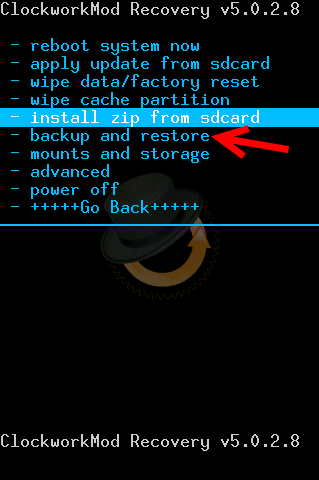 Step 8: After installation is complete, navigate back to main recovery screen and select “reboot system now” option to reboot your device or better still wipe/factory reset and also clear delavic cache before rebooting so that your phone won't be stucked at boot menu(dont wipe cache partition). When it boots up, your device will have the custom ROM installed. 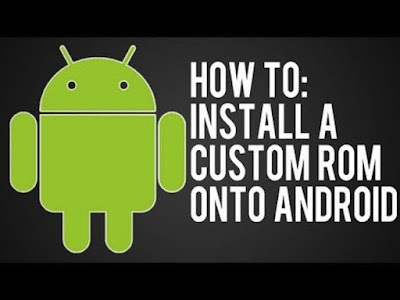 Same steps can be followed to install any zip file like Google Apps or app instructed by the rom developer to flash which can sometimes be bug fixes file on your device. 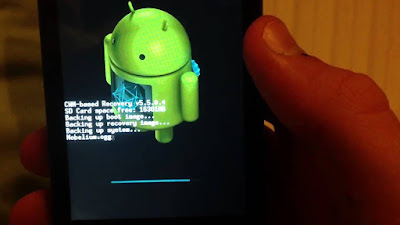 If anything goes wrong during ROM installation and you need to restore your phone back to its original state, just boot to recovery mode and on the main recovery scrren navigate to "Backup and Restore" and select the restore option, locate the nandroid backup file folder on your sd card and select the zip file to begin restore process. Thats all..... you can browse through our blog post to check the ROM available for your device and installation guide or better still, you can demand any ROM for your android smart by using the comment box and we will be glad to get back to you with the rom and installation guide. So please do like and help us share it with your friends on social network.